Our ancestors were originally called Gorefenne or Gorfenne. Gorefenne is an Anglo-Saxon word meaning ‘muddy fen’ and was the name of a farm in Cheriton Bishop in Devon (there is also a Gorwyn place-name in southern Wales from a quite different Celtic root meaning white or bright; but there is no reason to suppose that people from there would have made the extremely difficult journey to such a remote rural area in deepest Devon). The first definite documentary mention of the farmstead of Gorefenne in Cheriton Bishop (and of our ancestors) dates from 1288. However, the farmstead is probably a lot more ancient than that. There is an Anglo-Saxon charter dating back to 976, by which the then Anglo-Saxon King Athelstan granted a large tract of land south of Crediton, known as “Hyple’s old land” to “his faithful vassal” Aelfsige. The charter describes a place called “Rook’s Fen” as being on the boundary of Hyple’s old land more or less where Gorwyn is now, so it seems likely that Rook’s Fen is the place that subsequently became known as Gorefenne. This was the time when King Athelstan famously claimed to have chased the Celts beyond the Tamar in an early example of ethnic cleansing, so if there was anybody living at Rook’s Fen (the name could refer to a geographical feature rather than a dwelling), they were probably Celts who were dispossessed by Anglo-Saxons around this time. After 1288, the name of both the farm and the family went through a number of different spellings, including Gorefen and Gorfen (both first recorded in about 1450) and Gorven (first recorded in 1461), before settling into its current spelling of Gorwyn (first recorded in 1559). Other spellings used at various times were Gorvin, Gorvyn, Gorwin, Gorwine, Gorwyne, Gorrin and Gorin, and until the early 20th century the name of both house and family was pronounced locally as “Gorrin”. The first mentions that I have traced of persons bearing the name are in documents of the late 1200s and early 1300s. There is an undated charter from the 1200s (probably about 1280)1 that refers to a “Richard de Gorfenn” who has a landholding in Tedburn St Mary (the parish just to the east of Cheriton Bishop). In 1288, a case came before the Assize Court involving a man called Julian Peny suspected of stealing livestock who was arrested at the house of “Richard de Gorefenne at Gorefenne”2. It is not clear what the alleged thief was doing at Gorefenne; the court record merely says that the Bailiff of Wonford and others suddenly came across Julian at Gorefenne at the third hour of the afternoon; they took him and bound him and then took him with them as far as the house of Robert de Tilledene (the nearby farm of Tillerton) and detained him there for the whole of the following day, after which Julian was taken to the parson of Wonford and held in the stocks for a week. But it sounds as though the bailiff had been summoned by our ancestor to arrest Peny, perhaps for stealing his cattle (the alternative interpretation is that he was harbouring the malfaiteur). The next mention of the family is in a deed dating from 1314 by which “Robert de Gorfenne” granted land in the “new borough of Crediton” to his tenant John de Herpford3. Following that, in 1332, Edward III raised a “lay subsidy” a tax to provide “for great and arduous affairs in Ireland and elsewhere”. It was levied on all people with moveable goods worth 10s or over, quite a high threshold at the time. The 1332 tax-payers are listed according to their ‘vill’ or ‘tything’ (in this context much the same as a Manor). The list for the tything of Eggbeer, the manor in which Gorefenne was situated, included one William Gorefenne. There was also a John de Gorefenne paying the lay subsidy in 1332 in Winkleigh, which is a parish some 13 miles north of Cheriton Bishop. As the 16th century Gorwyns owned property in Winkleigh, it seems likely that he was a brother or cousin of William de Gorefenne and that his descendants gave out, so that his property came by inheritance to the Cheriton Bishop branch4. William was paying tax of two shillings on his movable assets, which made him the third largest tax-payer in the area, after William Knouston at Medland paying 4s and Margaret Kelly, from the family that owned the Manor of Eggbeer, who was paying 3s.4d. In particular, William de Gorefenne was paying considerably more than his subsequently grander neighbours, the Fulfords of Great Fulford. This may have been because the tax in those days was skewed in favour of the upper classes, as the definition of moveable goods excluded things that only nobility and gentry were likely to have like armour, jewellery and precious vessels, whereas William Gorefenne’s assets no doubt consisted mainly of livestock (including the oxen then used for ploughing) and grain stores. Nevertheless, with landholdings in several parishes, the Gorefennes appear by then already to be people of substance. It was not unknown for some freeholders to be almost as wealthy as their overlord, and the Gorefennes were probably pretty large fish, albeit in a very small pond, and at that stage could well have been grander than the Fulfords. Where did Richard, Robert and William Gorefenne come from, and how did our ancestors come to have that farm? Hereditary surnames were rare in the 1200s and became common only in the 1300s and 1400s. Anglo-Saxons tended to adopt them earlier than Britons or Normans. So it seems likely that Richard and Robert were Anglo-Saxons who had been granted Gorefenne early in the 13th century or even before, as they were already using the surname in the 1200s. The Manor probably totalled around 700 acres. The above entry indicates that, apart from the lord’s farm, there were four villeins or villagers, each renting a small farm from the lord in exchange for services. It is perfectly possible that one of these farms was Gorefenne, and it is also possible that one of the four villeins was our ancestor. If so, the family could have been there since before the Norman conquest. They may even have been Anglo-Saxon followers of Athelstan who took possession of Rook’s Fen when Athelstan chased the Celts out of Devon in the tenth century. Alternatively, our ancestors may have been granted their farm after the Norman conquest. The new Norman landlords installed by William the Conqueror probably began early on to make grants of land - probably the less desirable woodland or scrubland or land on the margins of their estates - to locals in exchange for a rent or feudal dues in the form of services such as so many days’ ploughing of the feudal lord’s own land. These locals would then build themselves a farmstead and clear and cultivate the land. Although they did not own the land, the dues owned to the landlord were not onerous (and became less so over time), so to most intents and purposes it was henceforth their land. The grant of land by large landowners to freeholders accelerated after the Charter granted in 1204 to the men of Devon permitting them to clear the Royal Forest. So it is possible that an unnamed ancestor was granted the land now called Gorwyn some time in the early 1200s, and then cleared the wooded area around his muddy fen to create a viable farm. However, given that the Gorefennes already held land in three or four parishes by the late 1200s or early 1300s, they had probably been around some time, and it seems more likely that their holding of the farm Gorefenne dated back to the 1000s or 1100s or even the 900s. There is a great shortage of any documentary evidence about the inhabitants of rural Devon in the century following the 1332 Lay Subsidy Rolls, as after that date the individual tax-payers are not listed. The second half of the 1300s also saw the disaster of the Black Death, which reduced the population of England by about a third. However, there are some references to Gorefennes or Gorfens in the legal and land records of the 1400s. A record survives of the feudal dues paid in the Manor of Eggbeer in 1428, which by that time was held by eight freeholders. One of these was Thomas Gorefen5. In 1453 Walter Gorfen was a witness to a deed involving properties in Crediton and Tedburn St Mary (a village neighbouring Cheriton Bishop)6. And in 1460, John Gorven was witness to a deed involving properties apparently situated in Cheriton Bishop and Crediton7. The legal records of the mid-1400s also contain a number of references to a Walter Gorfen or Gorfyn who was active in other parts of the country in trustee-type roles. In a 1460 document, for instance, he is described as ‘late Receiver of the Duchy of Lancashire in the South parts’, in a dispute about the payment of an annuity out of an estate in Dorset; and he was also involved in estates in Essex. As the name is such an unusual one, it is at least possible that he was the same Walter as the one who witnessed the conveyance of land in Crediton and Tedburn St Mary in 1453 and was of our family. If so, he would be the only recorded member of the family before the 19th century to make a mark on the wider national stage . The Duchy of Lancashire was fairly heavily involved in Devon, and he may have been an able administrator who first performed services for the Duchy in the county and then was drawn into a wider role. There were two other possible people operating outside the West Country who might be family members. A Thomas Gorffyn was a defendant in legal proceedings sometime during 1500-15 concerning an annuity payable to Leonard Poullet Esq. out of the Manor of Basing, Hants8. The Poullets were big landowners in Dorset, a neighbouring county to Devon, so Thomas could be another early member of the family who made his fortune away from home. There is also a record of a Sir William Gorfyn living in south and east England who acquired lands from Henry VIII9 and who could be a family member, although that seems a bit more unlikely. The next certain sighting in the records of a member of the family is in an “Inquisition Post-Mortem” following the death of Thomas Gorfen in 1524, i.e. in the time of Henry VIII10. Such inquisitions were local enquiries into the lands held by people of some status, to ascertain whether any rights or income were due to the monarch from their estate. Thomas Gorfen is described as a “gentleman” and his landholdings are given as “the Manor of Gorfen with its appurtenances....and divers lands and tenements, meadows, woods, pools, pastures and pasture-lands, lying in the parish of Cheriton Bishop....belonging or pertaining....to the same manor of Gorfen and also of....two tenements and divers arable lands, meadows, pastures and pasture-lands and woods pertaining to the said tenements in Towe, Gernesland, Byttebeare and Reddison in the parish of Winkleigh”. The description of Gorfen as a manor is a little fanciful – by the 1500s, the manorial system was breaking down and the terminology was probably used somewhat loosely. The document also says that the land in Cheriton Bishop was “held of John Fulford Esq”; by then the Fulfords were the Lords of the Manor of Eggbeer in which Gorfen lies (having presumably acquired it from the Kellys), and that was undoubtedly the true manor. Gorfen and its lands were valued at 34s a year, and the land in Winkleigh at 20s. Thomas’s heir is given as his son William, aged 33 at the time the inquisition was done. Detailed tax records resumed in the first quarter of the 16th century and there are good records of the lay subsidies raised in 1524 and 1525 to finance Henry VIII’s war with France11. While Thomas was undoubtedly a significant landowner, these records show that by that time the family had split into several branches, some even richer. These taxes were payable by everybody with moveable goods worth at least £2 or earning annual wages of £1 or more. Seven of the 60-odd taxpayers in 1524 in Cheriton Bishop were ‘Gorvens’. Not only were they the largest tax-paying family in the parish (seven of the 65 tax-payers were Gorvens), but they were among the richest taxpayers: whereas most taxpayers declared goods of between £1-3, two of the Gorvens (Peter and Stephen) had goods of £5; two of £4; and William (presumably the son of the John Gorfen whose estate was the subject of the post-mortem inquisition) declared goods of £3 (the other two are wage earners of £1 per annum). Individually they are not the richest people in the village; one William Shylstone is recorded as having goods worth £10. But in terms of overall wealth they are clearly the dominant family in the parish. When a subsequent lay subsidy was raised in 1544 (this time to enable Henry VIII to continue his war against Scotland), Peter Gorffen declared goods of £10 (up from £5 in 1524) compared to William Shilleston’s £20. It is quite hard to assess what these figures represent in terms of today’s money. The goods on which the valuations are based would have been mainly coin, plate, merchandise, harvested corn stored in ricks or barns, livestock, farm implements and household furnishings (but excluding clothes). In practice, the valuations were probably gross under-estimates and should be multiplied by a factor of three or four12. So Peter Gorfen’s goods in 1525 were probably worth £15-20. Against this, an average day labourer’s wages probably amounted to little more than £1-2 a year. It is impossible to be absolutely sure that the 13th and early 14th century Gorefennes were the forefathers of the Gorvens recorded in the 1520s. It was not unknown for a family named after a property to die out and for new owners of the property later to adopt the name. It could therefore be that the original Gorefennes were wiped out in the Black Death and new occupants of Gorefenne adopted the name. But this seems extremely unlikely, given the various references to Gorfens in the 1400s, and also given the fact that in 1524 the family were so numerous. Their preponderance in Cheriton Bishop may well be just because they survived the Black Death, whereas many other Cheriton Bishop families probably disappeared 13. Certainly in the 1300s, the Gorefennes appear to have been people of some status, indeed of very similar status to other families who subsequently rose to be major landowners and county magnates. Yet they seem to have failed to take advantage of the opportunities offered by the empty lands left by the Black Death and the growing wool trade (and by advantageous marriages) to make the leap from prosperous freeman to big landowner. They kept their riches and continued to flourish as minor gentry in Cheriton Bishop, but no more. 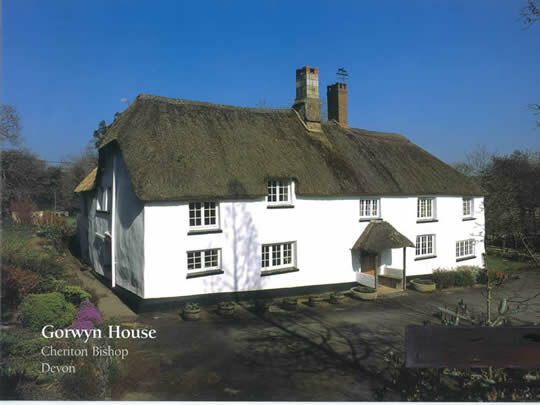 The core of the present house at Gorwyn dates back to the mid-1400s and was built as a typical Devon cob and thatch long house. It had a medieval hall, the fire-place in the middle with the smoke rising to a hole in the roof. Signs of this can still be seen today in the blackened thatch over the central part of the house. The inhabitants would have lived in the higher end of the house to the left of the front door; the animals and stores would have been at the other end. Pevsner comments that ‘Gorwyn must have once been a superior medieval house’14. So it seems that the owner of Gorwyn in the mid-1400s – perhaps Walter Gorfen – was rich enough to replace an earlier and more humble dwelling by a house that was really quite grand for a yeoman farmer. Although the Black Death caused a depression in other parts of the country, Devon seems to have remained reasonably prosperous because of the growing wool trade. Many of today’s Devon churches, as well as quite a number of farmhouses, were built or rebuilt in the mid-1400s. A hundred years later, the mid-1500s were a time of more general prosperity for English agriculture, and the family seems to have been doing well enough to add first one new wing and then later another, giving the house the shape that it retains to this day, like an E without the middle stroke. The left wing includes a kitchen with an inglenook fireplace that probably replaced the earlier central fireplace. Around this time the animals were probably moved to an outhouse, and a parlour or other living accommodation created in the part of the house previously occupied by them. Today, the house is a Grade II* listed building under Government conservation legislation. In 1558, parish records began, and from then on the Gorwyns are well documented. Hardly a year passed without a Gorwyn birth, marriage or death being recorded in Cheriton Bishop, with a good sprinkling also in the neighbouring parishes of Drewsteignton and Crediton. In 1569, each parish had to raise a local militia (similar to the Home Guard), and Richard Gorwyn is recorded as a pikeman in the Drewsteignton Muster Roll of that year. The 1569 Muster Roll also includes a Gorwyn in Holcombe Burnell; there was a family of Gorvens in Moretonhampstead in the early 17th century, and occasional Gorwyns or Gorvens pop up in the records of Whitestone, Tedburn St Mary, Dunsford and Holcombe Burnell, all parishes near to Cheriton Bishop. Unfortunately, the Gorwyns were extremely unimaginative in their choice of first names – their favourites were Richard, William and John, and at any one time there were usually at least two John Gorwyns living in Cheriton Bishop – so it is almost impossible to trace relationships or lines of descent. But it seems clear that they were a numerous and successful family, probably split into several branches with Gorwyn being only one of several farms occupied by the family in Cheriton Bishop and Drewsteignton. Presumably younger sons had occasionally to look further afield for farms (or married farmer’s daughters from elsewhere), hence the appearance of the family in other parishes. By the early to mid-19th century, however, the Gorwyns in the other parishes all seem to have died out, whereas Cheriton Bishop and Drewsteignton (and the rural part of Crediton) were still full of Gorwyns and Lambert Gorwyns, and a new branch had established itself in Spreyton, a village five miles to the north-east of Cheriton Bishop. There are two records in the 1600s that are interesting because they give some indication of social standing. The first is the “Protestation Returns”, prepared by the order of Parliament in 1641, and listing all males in each parish who belonged to the established (ie Protestant) church. The Cheriton Bishop list is particularly interesting, as everybody listed signed either their name or their mark, so their literacy is revealed. The vast majority cannot write and have left only a ‘mark’, a cross or a shakily drawn initial. But three of the five Gorwyns or Gorvens sign their own names in clear and confident hands. The other record of interest is that of the Poll Tax raised by Charles II when he came to the throne in 1660 and needed money to pay off the troops disbanded after the end of the Protectorate. This 1660 tax list records 16 Gorwyns in Cheriton Bishop, still the biggest single family in the parish. Several of them had estates valued on the high side: Alice Gorven’s estate was valued at £24, third only to Zacharie Davie15 (£31) and John Burnell (£26); and there were a William Gorven and a Richard Gorven also with decent-sized estates. 1 Devon Record Office ref: Z1/31/9/1. the deed says that Christine, daughter of Richard Chepyn of Morchard Bishop, is to render to Richard de Gorfenn for all services 4s 3d yearly for one ferling of land in Hembeer (Tedburn St Mary), consideration 16s. 2 National Archives ref: JUST1/1280. 3 DRO ref: Z1/10/7. Robert de Gorfenne grants to John de Herpford his tenant in the new borough of Crediton which is between the tenement which Richard called le Wyte holds of the grantor in the west and the tenant of Henry de Christenstouwe in the east. Witnesses Henry de Christenstouwe, Peter de Trobrigge; John Maydegod, Walter Unyng, John de la More. Date 12.4.1314. Crediton, along with 16 other places in Devon, had been granted Borough status in 1307, with the right to send two representatives to Parliament. There is also a record in the Plymouth and West Devon Record Office of a Richard de Gorfenne being a witness to an enfeoffment (conveyance) of lands in Tedburn St Mary (ref: 1221/2). The other witnesses include Lord John de Kelle (i.e. Kelly) and William de Foleford (i.e Fulford), both from prominent local families. 4 There was also a farm call Gorfenne (now Gorvin) in Hartland, in the far north-west of the county, which gave its name to a family noted in the records of the 1200s, but the last mention of the Hartland Gorfennes was in 1301 when “Sarra and Agnes de Gorfenne” are mentioned in a list of the free tenants of Hartland. Later in the 1300s, the farm of Gorvin seems to have belonged to a family called Holman, whose heiress brought it to the Prust family, who were there for several hundred years. So it seems probable that Sarra and Agnes were the last representatives of those Gorfennes. The 1332 lay subsidy roll also included, in the tything of Lampford, an Antoninus de Lampford; and a 1454 deed in the DRO (ref: 312M/TY243) also refers to a John Antony de Lampford the Elder in connection with a property called Poleworth, parish unspecified. It seems probable that these Lampfords were the people living at Lambert in the 1300s and 1400s, but that the family died out, as they disappear from the records. 5 Inquisitions and Assessments relating to Feudal Aids preserved in the Public Record Office. The transcription gives the name “Thomas Gorason”, but this is almost certainly a mistranscription, the medieval “s” and “f” being very similar when in the middle of a word. Moreover, the original document is itself a 16th century copy of the original, increasing the chances of a mistranscription. 7 John Gorven is the witness to a deed whereby John Borne and John Eggbeare grant to Thomas Kingswill at Thorn all their estate in Thorn, E. Pyttyn, S. Bowden, N. Bowden, Wotton, Heah’, Yeo by Westwater, Wode and Crideton. (Devon Record Office: Z1/10/49). Thorn, Pitton and Bowden are all farms in Cheriton Bishop, and Bowden was later purchased by the Gorwyn family (although there was also a Bowden in Crediton). 11 Devon Lay Subsidy Rolls 1524-25, ed. T. L. Stoate. 12 This was suggested by W. G. Hoskins on the basis of a comparison of valuations done for the lay subsidy and those done for probate of husbandmen in Leicestershire during the same period. 13 In his book Surnames of Devon (1995) David Postles comments that “Demographic decline in the later Middle Ages and the consequent contraction of some communities produced isonymy – a concentration of surnames – within a number of communities [and] the pre-eminence of some core families in some communities”. He cites the Gorvyns of Cheriton Bishop in 1524 as an example of such isonymy. 14 The Buildings of England: Devon, second edition by Bridget Cherry and Niklaus Pevsner.